Alain is professor at the Saint-Louis University (Brussels) and the UCLouvain. He is specialised in intellectual property, information and technology law. His courses cover mainly digital copyright, as well as media and information law. The interactions between law and technology and law and innovation are at the core of his teachings and research. At UCLouvain he teaches among others a course on ‘Intellectual Property and New Technology’. He teaches as well within the LLM programs organised by the KULeuven (course of ‘Design law’) and the Munich Intellectual Property Law Center (‘Practice of copyright law’). 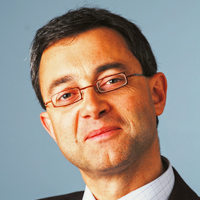 Alain graduated in law (1983) and obtained a Ph.D. in law (1992) from the UCLouvain. In addition, he obtained graduate degrees in economics (1984) and philosophy (1985) from UCLouvain. He also obtained a post-graduate diploma in European Integration at the University of Amsterdam (Europa Institute, 1985). Between 1988 and 1991, he got research scholarships from the Max-Planck Institute (MPI) for Innovation and Competition and worked at the Munich-based MPI on his Ph.D. In 2000, he spent three months at the Columbia Law School (New York) as visiting scholar (where he also contributed to a course on ‘International Copyright Law’). Alain Strowel is avocat at the Brussels bar since 1988. Alain’s practice concentrates on intellectual property, media and information technology law. Prior to join the U.S. firm Covington & Burling LLP, where he worked on European law matters between 2001 and 2014, Alain worked in the Brussels IP department of the Dutch firm NautaDutilh. Alain is active in several associations involved with intellectual property, such as the Association Littéraire et Artistique Internationale (ALAI) and the International Association for the Advancement of Teaching and Research in Intellectual Property (ATRIP). He is member of the editorial board of several law journals (Auteurs & Media (Belgium), Propriétés intellectuelles (Paris), Les Cahiers de propriété intellectuelle (Montréal), Computer Law Review International (Cologne)). He has been nominated as member of Academia Europaea (The Academy of Europe) since 2012 and participates to the IP working group of the All European Academies (The Hague). Since 2012, he is a member of the Board of the European Academy of European Law (ERA located in Trier). Alain has prepared several studies for the European Commission and was involved with the awareness and educational programs initiated by the World Intellectual Property Organisation (WIPO). He participated to several missions in Asia (Indonesia, Korea, Russia and China), Middle-East (Koweit and Lebanon) and Africa (Benin, Ivory Coast, etc.). Alain is a panelist for the WIPO and the Belgian domain name dispute resolution systems.